Goddess Sarasvati, the primeval goddess of knowledge, arts, music, and language, is worshipped in the month of Magh. From this day onwards the spring season or Basant Ritu begins in India. The goddess represents creative power and energy in its form. Vasant Panchami is marked with arrival of Vasant Ritu, which is also known as Spring Season. As this season arrives, festivities start. Monotony of chilling winters goes away and crops are sown. Vasant Panchami, one of the most popular festivals of Hindu, is dedicated to goddess Sarasvati, the deity of knowledge and all forms of arts. Every year the puja is performed on the Panchami.The day of Magh is also the beginning day of spring. The Goddess stands for serenity and peace. Generally placed on a lotus she is clothed with a milk-white silk sari. Her lower left hand is occupied with a book. Her four arms signify four characteristics of human personality namely intellect, mind, alertness and ego.And the lotus of her hand symbolizes the knowledge. The swan beside her is the embodiment of purity and it confirms the fact that we have the inner ability to differentiate the dire from the good. 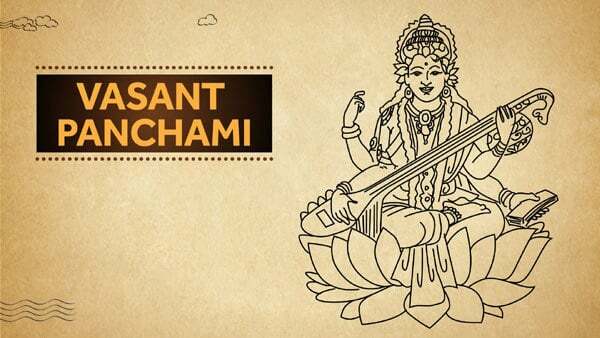 Vasant Panchami or the Sarasvati day is performed by the Hindus all over the world with great eagerness. Yellow color symbolizing the spiritual knowledge is given importance on this special occasion. The devotes dressed up in yellow garments perform the ritual. Vasant Panchami is the occasion when the kids are also made to learn their first words. Schools and colleges also arrange special worships for the deity. For the Devotees, worshipping of Sarasvati shows the way of spiritual enlightenment to human being. Saints and learned people are inclined towards holiness and they know the significance of Sarasvati Puja. Other rituals that are made on this occasion include adoration of Kamadeva. Kite festival is another ritual of Vasant Panchami and is observed in Punjab Ferozepur. Vasant Panchami symbolizes the coming of spring and it can be noticed seeing the colored blooms in trees and ripened crops in the field. The people who are arranging the puja must take a special kind of bath in the early morning. The bath water must have some medicinal herbs like neem and tulsi leaves. The devotees must apply a paste of neem and turmeric on their body before taking the bath, this ceremony purifies the mind and body and also defends a human body against all kinds of illness. After the bath, the devotee must wear white or yellow colored garments. Clean the place first of all, where you are going to put the idol. On an elevated place, spread a white cloth to put the statue on it. You should use Kumkum, Turmeric, Rice, Flowers, and Garlands. Arrange your books and musical instruments near the deity. Fill all the inkpots with milk and put wooden pens in it. Put water into the Kalash to set a twig of five mango leaves and then put a betel leaf above it. After that, you should keep Durva Grassand the Betel Nuton it along with a blossom on top. Reciting the mantras take flowers in your hand along with bel Patras and pray to Lord Ganesha first. Then do the same for Goddess Sarasvati while Chanting invocation of the deity, light the oil lamp and incense sticks. Offer some fruits, sweets and other foodstuffs to the Goddess. Finish your art and chant hymns praising the idol. You should not study after the puja that day. Eat only vegetarian food on this day. The next day when Vasant Panchami is over, write ‘Aum Sarasvati Namah’ on the presented bel Patras with that wooden pen by sinking it in the milk before immersing the idol. Put the bel Patras again to the deity and pray. Then, plunge the idol in water. All devotees should take veg items as food on this day. The smallest daughter of the relatives has to wear a yellow colored saree as a popular custom. If there is a child in the family, ask them to write the alphabets by the priest who implies her first step being taken in the achievement of Knowledge. The thread on the earthen pot is untied in the next day and it indicates the end of the puja. Yogurt, bananas, and Khoi (puffed rice) are offered to the idol as she departs. The Vasant Panchami Puja Muhurta 2018 starts at 06:22 am. In the morning and will last till 11:48 pm. Panchami Tithi Begins at 15:33 pm on 21st January 2018 and ends on 16:24 pm on 22ndJanuary 2018.